In The Benedict Option: A Strategy for Christians in a Post-Christian Nation, Rod Dreher argues Christianity’s future lies in a monastic lifestyle not unlike the monasticism fathered by the medieval monk Benedict. In Dreher’s thinking, the dominant secular culture has grown so corrosive and overwhelming that Christians should take to the hills, literally. Dreher’s premise is appealing. He is correct: Christians face a dire need for an effective strategy to address the challenges of the secular culture. But I found his analysis and his solution unconvincing. A wholesale retreat into monasticism opposes the core mission of Christianity. The faithful have been commissioned to go forth, to the ends of the earth, to convert souls. In fact, the current cultural imbalance seems to be the result of a steady retreat over the past two hundred years. Perhaps the better solution is to redouble our efforts to engage and battle the secular culture. This is not a time for retreat, but rather a time for a noisy offensive. But such a campaign is contingent on our ability to field an army of spiritual warriors. Perhaps it is the current absence of a fearsome fighting force that motivates Dreher’s desire to retreat to safety behind monastery walls. Who would not want to retreat if they were unable to defend themselves? This thought drew my attention to a shortcoming in Dreher’s proposed option. His theology does not quite hang together. Perhaps the inability to wage successful battles has been due, at least in part, to the deficit of sound theology. This spiritual deficit is not new. For the past couple hundred years the battle with secularism and materialism has been undermined by the lack of robust theology. When Christian warriors found the weapons in their hands wanting, they retreated. They felt powerless to defend against the cultural assault. Thus, a priority is arming Christians with powerful spiritual and theological weapons. 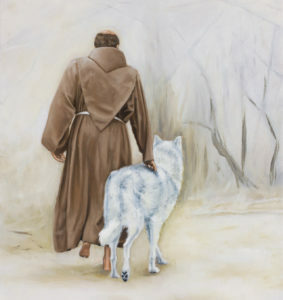 Franciscan spirituality, with roots in early church theology, may be the solution for our time. Saint Bonaventure, a Franciscan, was at the Academy in Paris at the same time as Thomas Aquinas, the father of Scholasticism. Hermitage became an integral part of the Franciscan tradition. The hermitage protocol began when Saint Francis of Assisi became torn between monastic seclusion and a life of public preaching. Saint Clare convinced Francis to combine the paths — she suggested integrating periods of hermitage with periods of public preaching. 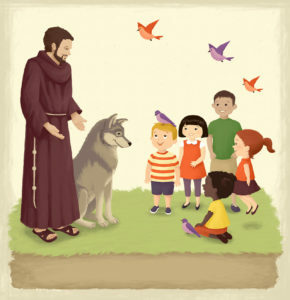 Thus, Franciscans became known as friars, not monks. Rather than becoming monks they became mendicants who went from village to village preaching and relying on the support of villagers. The Franciscan model — contemplative life alternating with evangelism — has immense value for today. Alternating hermitage and preaching may best address the current woes of Christians. In this model, individuals enter into hermitage to procure spiritual weapons received through contemplative prayer and mystical union. This training develops a sacred mindset sufficiently robust to engage the secular culture in battle. Thus, I suggest we consider a different option: The Assisi Option. In this approach, spiritual activists, men and women who have devoted time to crucible of contemplative prayer, will engage in robust evangelism and will simply be called contemplatives. Perhaps we might consider them part of the final Franciscan Order that Pope Benedict XVI called a Seraphic Order, an angelic order dedicated to transforming the world through prayer. During contemplative prayer participants will become infused with the Holy Spirit. They will undergo spiritual transformation from false self to divine self. When they go forth two-by-two to minister, their state of being-in-love will convey the truths of divine relationship. After being infused with the Holy Spirit, they will be better able to infuse the world with Spirit. 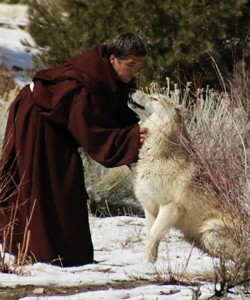 Contemplatives, after completing their hermitage, will go forth as peacemakers, like Saint Francis. The fruits of their reconciliation work will ripen along their path through the fallen world. The pastoral counseling they deliver will bring healing and comfort. They will console everyone they meet with the gospel message “be not afraid.” They will deliver the sacred “look of love” that all people crave. They will preach, using words when necessary. Their preaching will convey love and wisdom and will convert souls. They will lead converts and the faithful on the path to salvation. Their mature personal divine relationship — their state of being-in-love — will draw others into relationship with Christ. During Eucharistic communion, as they encounter God humbly bending low to greet them, others will follow their gaze to discover the miracle of the Real Presence. During their peacemaking, healing, and preaching ministry, contemplatives will no doubt suffer the wounds common to the spiritual battlefield. Repeated visits to the cave for hermitage will be required. When they return to the cave other contemplatives will be dispatched to take their place. This continual rotation will produce stability in the Church, and will slowly but inexorably hasten the arrival of the Peace of Christ. The evangelism of contemplatives will induce other pilgrims to follow the contemplative way. The uninitiated will be guided to “the cave” where they will come to experience mystical union. 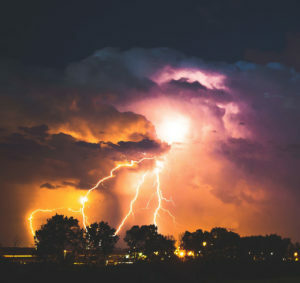 After souls in hermitage rehabilitate their endowment of the image and likeness of God, they will be better prepared to rehabilitate a world in despair. God’s presence in the world, shining in the demeanor of contemplatives, will illuminate sacramental signs. When the faithful are blessed with contemplative vision in their midst, they will find their spiritual vision improving. They, too, will begin to see God’s presence in every creature throughout Creation. Contemplatives will be fishers of men. The vital task of evangelism will finally rest in the hands of those truly prepared. They will operate on a scale and with such power that the cultural challenges that prompted the Benedict Option will be overcome. The Assisi Option will place victorious spiritual warriors on the battlefield of the culture. What will the Assisi Option look like in practice? First, a network of hermitage sites or spiritual direction centers will be established. These spiritual retreat centers will offer advanced spiritual direction and spiritual formation. They will specialize in applied theology. This plan has an important precedent. During hermitage on Mount LaVerna, Saint Francis and Saint Bonaventure both found mystical union with Christ. 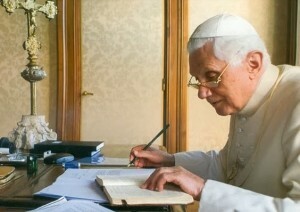 Their prayerful contemplation generated profound works on spirituality. They exported the wisdom gained in contemplative prayer to distant lands. Out of the cave arose an applied theology that enabled people see the divine within each other. Out of the cave emerged a heavenly light that dispersed shadows. Participants in the Assisi Option will not travel to exotic or remote locations. They will not prepare for a monastic life. 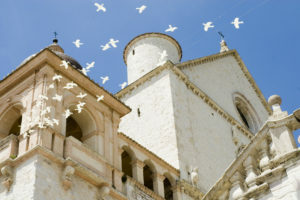 At the Assisi centers they will seek the deep spiritual transformation that fosters mystical union. Once transformed, they will go forth as new disciples. Contemplatives will straddle this world and the next. They will not only seek mystical union, they will also seek to gain the skills they need to rescue trapped souls. They will train as peacemakers, reconcilers, and healers. They will train as spiritual directors and pastoral counselors, as preachers, teachers and evangelists. The great majority of contemplatives will be laypersons. Clergy, especially deacons, may also take part. Contemplatives will travel and minister where they find the greatest need, however, in the majority of cases, they will serve the nearest parish. The majority of participants will attend a nearby retreat center on a daily basis. There they will engage in mediation training, instruction in pastoral counseling, spiritual direction, and the contemplative prayer of hermitage. At any one time from two to four members of a parish might participate. Each parish will rotate those on hermitage with those in public ministry. This rotation will make sure the parish and the surrounding community will be served at all times. Contemplatives’ depth of spiritual formation and depth of lived faith will enable them to grasp reality at its deepest and most comprehensive level. Able to marry faith and reason, they will convey the truth of the faith as very few have known it. They will know how to disperse the cultural views that block man’s relationship with the divine. Peacemaking skills will enable them to battle the false views dominating the culture. They will defeat the death grip of materialism and atheism. Faulty viewpoints will wilt under the glare of their wisdom. Contemplatives will engage in applied theology based on Benedict XVI’s dialogical theology, the theology of relationship. Their loving testimony to Christ’s presence will overcome the adversarial secular culture. Loving pastoral care will bring sacred knowledge that dismantles the falsehoods of a fallen world. Rather than retreat to cloisters in the hills to watch from afar – as the world experiences wholesale destruction – contemplatives, refreshed periodically by periods of hermitage, will robustly engage the culture, starting with the Church. Disciples in the new Seraphic Order will hasten the arrival of the Peace of Christ and the salvation of souls. These trained spiritual warriors will have no match in the worldly realm. There is little time to spare. The Assisi Option should be implemented with all due haste. Let us not retreat; let us advance as spiritual warriors to meet today’s challenges. Let us not hover over a campfire secreting the faith away, as though it were a prize we alone have won. Rather, let us light torches and go forth to fulfill our commission. Let us bring the living Gospel to all corners of the world. If you have any comments or suggestions regarding the Assisi Option, please let us know. We would love to hear from you.